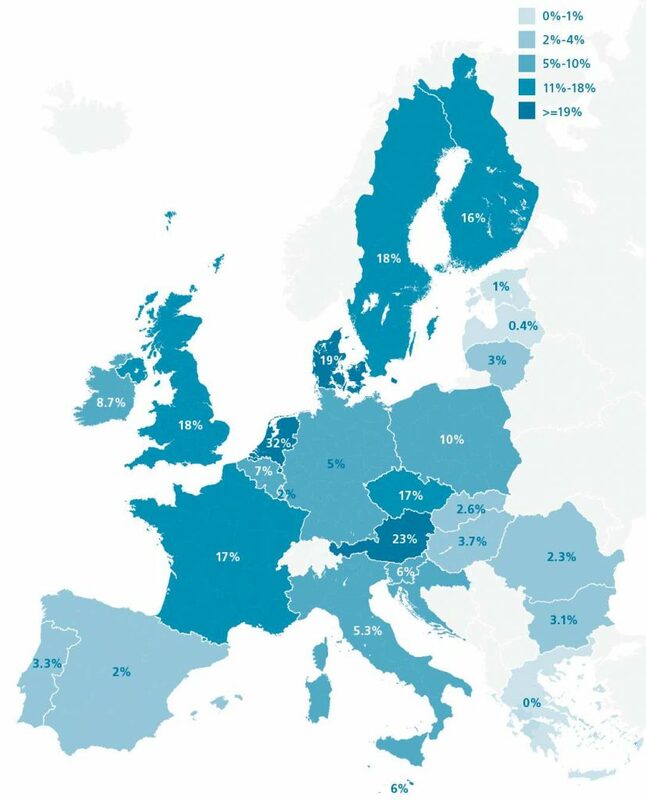 The map from above (CECODHAS Housing Europe Review, 2011) shows that Romania is among those EU Member States where the percentage of the social housing within the whole housing stock is the lowest. According to the data of the National Statistical Institute, in 2017, from the total of 8.976.794 homes 8.867.146, over 98%, were in private property. This is due to the privatization of the old state housing fund (through policies of retrocession and the right-to-buy) and to the fact that after 1990 the majority of governmental housing programs supported the creation of private housing. Even the National Housing Agency promoted the removal of the dwellings from the state housing stock by selling them to the tenants. These measures ultimately sought to support the housing market and real estate-banking business with the aim of making the largest possible profit for banks and developers. They were part of the policies for the creation of opportunities for domestic and foreign capital investments, opening up Romania to the transnational investment funds in the field of real estate transactions. Since housing is almost entirely accessible only through the market and most of the dwellings are built to be sold or rented, the commodity and capital accumulation functions of housing have become dominant and overshadow its social function. The Romanian state is reluctant to recognize the right to housing as a fundamental human right. It promises, at most, to ensure citizen right to access to housing. Moreover, it dissociates itself from the obligation to ensure the de facto access to housing for all through measures that could rebalance the income inequalities created by the capitalist political economy. Instead of strengthening governmental programs for social and public housing or protection measures for tenants evicted from restituted buildings, starting from 2010, the Romanian state further facilitated the eviction of people who had no other alternative but to occupy empty buildings/lands or to opt for various types of informal housing. Despite its anti-discrimination legislation institutional racism continues to affect Roma in Romania. In the case of Roma living in poverty, the racialization of ethnicity dovetails with that of poverty. This is visible in group-evictions, in actions that are pushing people to the underdeveloped urban and rural peripheries, and that continue to confine them in inadequate housing conditions and their exclusion from access to public social housing. Apparently, everybody knows that the rate of poverty and social exclusion in Romania, as well as the rate of in-work poverty are among the highest in the European Union. It is also common knowledge that Romania is in the top in European rankings on rates of housing deprivation, housing cost overburden and over-crowding. Ɣ high costs of living rooted in housing policies that support the big capital in this domain, too. After 30 years of neoliberal capitalism, it is time for a new public housing policy that seeks to eliminate existing injustices and inequalities. – As MEPs, you will be able to join the progressive forces from other countries, starting from your awareness about the specific manifestations of housing crisis in Romania. The housing crisis generated by neo-liberal politics since the 1980s affects more and more people in all EU Member States. The costs of housing are some of the largest expenditures for many households. The households’ indebtedness with the housing costs remain remains constantly high, affecting poor and precarious social categories disproportionately. Real estate prices are rising faster and higher than wages in most EU Member States, while income inequalities and housing exclusion reinforce each other. Finding affordable and adequate housing is increasingly difficult for more and more people, because in the cities where jobs are available, housing is expensive. Given their indebtedness to the banks, the number of families on the verge of losing their home and their livelihoods increases every day. Private rental price continues to grow in all countries, and local governments are usually not able to control it. Young people are among the most affected categories by these problems: lack of adequate housing keeps them in various forms of dependency and makes them vulnerable in all areas of life, from work to private life. Even if the EU condemns discrimination and racism, and has a European framework strategy for Roma inclusion, it still allows institutionalized harassment of Roma from Eastern Europe who are looking for living resources in the old EU Member States. All these structural problems in the EU are rooted in the privatization of the housing stock (both the already completed privatization, and the one that is ongoing in the countries where there is still a public housing fund that might be privatized and where housing associations own social housing they can put on sale). In addition, all of these issues are part of housing financialization ongoing across whole Europe, even though in different ways and to different degrees. Various financial actors (banks, real estate developers, real estate agents, investment funds), aiming to increase their profits, take over both the production and transactions of housing. Because there is no public housing, more and more households become increasingly indebted to financial institutions in their effort to become homeowners. Ɣ is a factor that contributes to reducing the risk of triggering new waves of financial and real estate crisis. Changing housing policy in the EU and / or in Romania is impossible if the European policy environment as a whole remains unchanged. Residual social housing policies (albeit not properly supported) cannot solve the housing crisis by themselves, at the same time as privatization, commodification and financialization of housing continue to be the building blocks of the European neoliberal economic and fiscal policies. (1) Rejection of the EU’s neo-liberal economic policy. Since the 1980s, neoliberal policy supports the unregulated movement of capital, including financial capital and investment funds, and implicitly its ability to capture a growing share of the housing stock of all countries, without bringing adequate and fair contribution to public budgets needed to secure the right to housing. (2) Redefining the content and status of social policy in EU. It is necessary to move away from the definition of social policies as measures that burden the public budget and increase the budget deficit. It is necessary to promote a policy approach that supports these measures as investments in public goods, which ensure the social and economic rights of all citizens. Finally, yet crucially, EU should ensure that social policies have the same normative strength in relation to the Member States, like the obligations imposed by European economic and fiscal policy have. (3) The European Union should assume an active role in the field of housing, and design and implement mechanisms through which it can exercise this role in relation to Member States, with the aim of producing more public housing. (4) The European Union should sign the International Convention on Economic, Social and Cultural Rights and endeavour to implement the imperative of ensuring the right to housing. (6) The European Union should compel Member States to comply with the international law on the prohibition of forced evictions, i.e. evictions that leave the evicted people homeless or forced to live in inadequate conditions. – Subsidies for social and affordable housing, which ensure fundamental rights, enable urgent social needs to be met and, as strategic social investments, help in a sustainable way to provide local jobs that cannot be ‘off-shored’, stabilize the economy by reducing the risk of property bubbles and household over-indebtedness, promote labor mobility, counter climate change, combat energy poverty and alleviate health problems stemming from overcrowding and poor living conditions. – Social housing should not be considered a cost to be cut but as investment that pays off on the long term, given the beneficial effects of improving health and increasing social welfare, enhancing access to the labor market and empowering people. Ɣ cease the redirecting of public funds towards subsidizing mortgages, and use such funds for the creation of public housing. Government support for mortgages and banks in general is not an adequate response to the housing crisis. On the contrary, this policy continues to place the state in the service of capital accumulation allowing for making huge profits from real estate (residential) transactions and mortgage agreements, while failing to meet the housing needs people have. Real estate markets do not solve the housing crisis; quite on the contrary, they create and aggravate it. → TAKE BACK THE CONTROL ON HOUSING FROM REAL ESTATE/BANK CAPITAL! → STOP IMPOSING CUTS IN SOCIAL SPENDING IN EU MEMBER STATES! → STOP FISCAL POLICIES THAT IMPEDE ENSURING SOCIAL AND ECONOMIC RIGHTS! → ADOPT A EUROPEAN STRATEGY FOR HOUSING, IMPOSED ON MEMBER STATES, WHICH (1) REGULATES THE REAL ESTATE BUSINESS, FOR THE PUBLIC GOOD, AND (2) SUPPORTS THE PRODUCTION OF NOT-FOR-PROFIT HOUSING! [Blocul pentru Locuire (Block for Housing) was established in 2017 as a decentralized network of groups that militate for housing rights, housing justice and the right to the city: Căși sociale ACUM! (Social homes NOW!) in Cluj, Frontul Comun Pentru Dreptul La Locuire (Common Front for Housing Rights) and E-Romnja in Bucharest, Dreptul la Oraș (Right to the City) in Timișoara. Later, Asociația Chiriașilor din Cluj (Tenants’ Association in Cluj) and Roma Just joined the network as well.